Locking Elevated Toilet Seat - 5"
Bath + Safe Lock-On Elevated Toilet Seats is a 5" (13 cm) high elevated toilet seats feature a special locking device that secures them to the toilet for added stability. Openings in the front and back allow for easy access. The seats with arms provide support while getting on and off the toilet. Width between arms is 19". Support up to 300lbs and fit most standard and elongated toilet seats. Safe. Functional. Easy To Install. Sturdy. Lightweight. 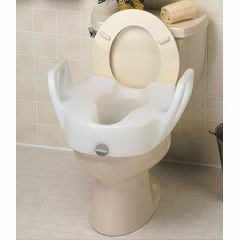 The elevated toilet seat with handles is easy to use and the handles are a necessity. No problems at all. I think that this would be a great product but it would not fasten securely in the back to our toilet â€” a contemporary design with seat and tank as one smooth piece, a model I have seen in many homes, especially new construction â€” rendering it unstable. If you are thinking of buying this and unsure if it will fit your toilet call Allegro before ordering to go over it with one of their very helpful sales-people. Unfortunately for us this is a non-returnable item and now we need to buy another type. Easy To Install. Functional. Lightweight. Sturdy. Nice design. Safe. Recovering from Surgery. Elderly. Disabled. The elevated seat is a lifesaver. My daughter found this, and it is a huge improvement over our other elevated commode seat. The construction is much safer, being all one piece without metal arms that extend too far from the commode for the space in our bathroom. I highly recommend it! Lightweight. Functional. Easy To Install. Easy To Install. Lightweight. Sturdy. Great seat. Easy install no to remove toliet seat. Wish the arms were longer and a bit taller. Overall can't go wrong. Is the Allegro toilet seat lift ID # 192744 compatible with ELONGATED toilet seats or is it designed for standard toilets, only? its designed for both elongated and standard size seats.